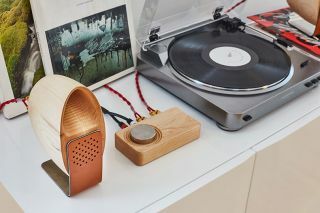 Grovemade reveals stylish wooden desktop music system | What Hi-Fi? A quick peruse of the Grovemade website shows the company is well versed in making stuff out of wood, and now it's trying its hand at a desktop speaker system. The Grovemade Speaker System is designed and made in Portland, Oregon, with each cabinet crafted out of walnut or maple hardwood. For the audio expertise Grovemade partnered with Portland-based industrial designer Joey Roth. Joey already has a history of designing speakers, but made from ceramic instead of wood. This wooden speaker system comprises two wooden speaker shells, fitted with 2in full-range Fountek drivers, and uses a back-loaded horn design to deal with low frequencies. The speakers connect to the supplied 2x25 watt amplifier, which has two RCA inputs for connecting the music source of your choice. Grovemade ships the Speaker System with speaker wire and an RCA to 3.5mm cable to get you up and running. The shells are precision machined at Grovemade’s Portland workshop and hand formed by sanding. They then get treated to two coats of natural oil before being buffed by hand. Grovemade has designed the Speaker System to fit in with its other products, which include desk stands for MacBooks and iPhone cases.